1981 brought dramatic changes to Dixie Camp. Walter Nellessen, owner of a successful construction firm in Vaparaiso, Indiana, bought and took possession of Dixie Camp on January 1st, 1981. For the most part, Walter remained in Valparaiso until 1983 in order to oversee his business there. Managers were hired to run Dixie Camp, which was soon renamed "Dixie Haven". Due to the various logistics of this arrangement, the new management sought little instruction from the previous owner. This was unlike all past sales of the Dixie, and it proved to reduce the quantity and quality of boat history and piloting skills that had usually been passed on to new owners. Immediately after purchasing Dixie Camp, Nellessen made several structural changes to the Dixie itself. Beginning in March 1981, a carpenter was hired to enclose the engine room area, add fake smokestacks and construct two "eyebrows" at the front of the boat. The eyebrows were added to permit easier passage to the lower deck. stacks and enclosed engine room added by Nellessen. Although the new engine room did provided extra sound proofing, most of the changes did not fit the original design intent of the vessel, which by this time had historical value. 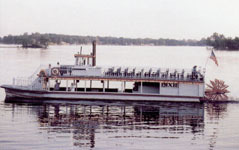 The Dixie had been built in 1929 as the successor to the original 1914 Dixie and was modeled after the earlier vessel. A significant amount of its original design features had remained unaltered through the years. The total amount of changes made to the vessel through 1980 were negligable compared to the changes made afterwards. 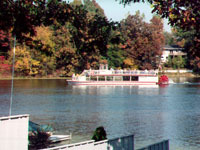 In 1981, Dixie Camp was given a significant face-lift. Until then it was no more than a small resort and campground with seven vintage 1920s rental cabins and a sternwheel vessel for excursions. Nellessen removed the old cabins and added modern motel units, a restuarant with a nice view of the lake, and a 50'x 40' boardwalk. from Steve Huffman (captain 1983-1986) in 1984. 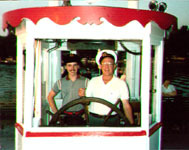 Right: Captain Steve Huffman at the pilotwheel in 1984.
resident "Kayra" (last name unknown). In 1985 the Coast Guard began requiring the Dixie to be dry-dock inspected every 5 years. 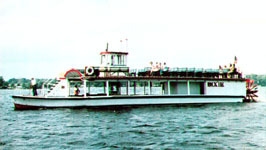 The Dixie had not been completely dry-docked since 1966, when Tag Huffman had a portion of the stern repaired. 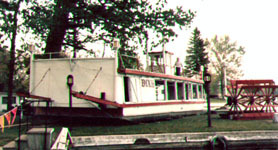 Prior to 1966 the Dixie had not been completely dry-docked since it was launched in 1929.
be raised on cribbing so that the hull bottom could be inspected. Tag Huffman can be seen walking on the top deck. In 1987, Nellessen split the lake property with the town of North Webster. Most of the lake shore area became the town park. Unfortunately there were several legal loopholes in the contract between the town and Nellessen. This resulted in the Dixie losing its no-cost docking rights. The Dixie must now rent the dock it had used since 1929. Left: Departing on an 8:30pm run, circa 1988. Right: The Dixie in 1989. Left: The Dixie, circa 1995. 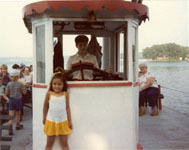 Right: Touring Webster Bay, October 1996. 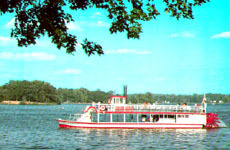 Nellessen sold the Dixie to Greg Van Pelt in 1987. In 1994 Greg sold the Dixie to Dan Thystrup, who also owned the Adventureland amusement park in North Webster. 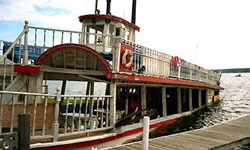 In 2007 ownership of the Dixie was transferred to the 501(c)3 non-profit Dixie Sternwheeler Inc.
was aboard and no serious damage was done. The Dixie was operational again within two days. * Photo courtesy of Craig W. Norrell, Times Union.